My son returned home from South Korea for celebrating Chinese New Year. 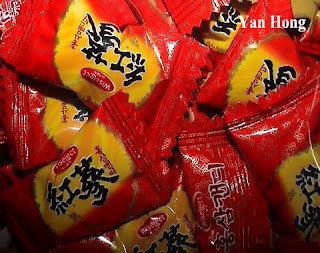 Besides buying green tea and custard pies, he also bought some ginseng candies. I don't like the ginseng candy because it's a bit bitter. I just ate a few and my wife gave them to her friends. During our tour to South Korea, I bought a few jars of ginseng extract but didn't buy the ginseng candy. When traveling in South Korea, remember to buy some ginseng products for yourself or your family and friends.